Acoustic deck 33 is a chipboard based premium acoustic deck overlay boards for timber floors with excellent airborne and good impact performance. This acoustic deck overlay system is known as robust details FFT5 Resilient overlay shallow platform floor system. Overlaying the floor with an isolating layer and a new hard wearing surface is the most convenient way of dramatically improving the airborne and impact sound performance of an existing floor. We have a range of acoustic flooring and acoustic decking systems which include acoustic deck 19, deck 28, deck 33 and deck 37 to suit most timber or concrete flooring systems. 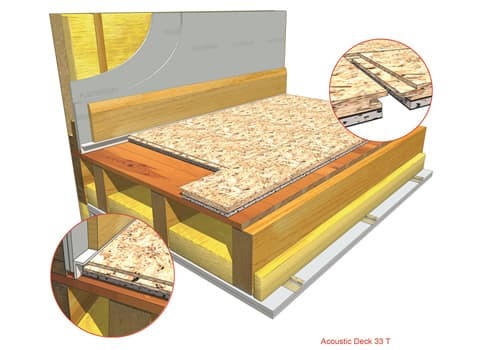 For more information on this acoustic deck call us today on 01204 548400 or for more soundproofing products click here.